Take advantage of this special offer and save 20% on an all-inclusive, crewed catamaran charter for selected weeks in October and December 2008. Encore, Moon Shadow, and Wild Thing are still currently available for this special week in October. Encore, Seas the Moment, and Moon Shadow are still currently available for this special week in December. There's still time to enjoy a New England sailing vacation this Autumn. Enjoy New England at its best with bright blue skies, fine sailing and uncrowded harbors! These excellent yachts are ready to sail! Ashlana is a Little Harbor 53. Owner/hosts Tom Hampson & Christie MacConnell are eager to make summer last a little longer with a charter or two before they leave for the Caribbean. Great sailing and a wonderful time to visit Block Island, the Vineyard and Nantucket. Accommodations for up to four guests in two cabins. Master cabin aft has 2 double berths with ensuite head and shower. Guests may choose one of the two forward cabins: The forepeak has 2 lower singles with a filler to make a double, the port forward (crew) cabin has upper/lower singles. The forward head and shower are shared with the crew. Guests praise Christie's cooking and Tom's sailing skills, and most of all their gracious hospitality. MELINKA, an 80-foot Swan, is available for charter out of Newport through October 14 2008. Accommodations for six in three ensuite cabins with generous twin berths located aft of the salon. The master has twin lower singles, port and starboard guest cabins have upper/lower singles. (No double berths.) Leather upholstery and fine oil paintings lend a 'gentlemen's club' feeling to the salon. 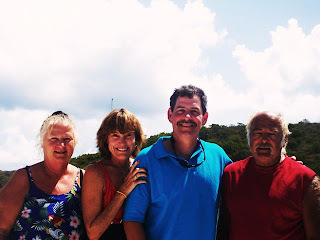 American Captain Forrest Shropshire, the head of MELINKA's international crew, has thirty years' experience sailing the East coast of the US and the Caribbean. Chef Maria Teresa Beddoes grew up on the Channel Island of Jersey and speaks fluent French, Spanish and Portuguese. 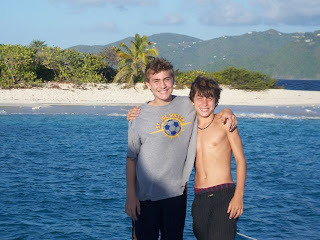 A second generation professional sailor from Antigua is Mate Jace Hector. $ 18,500/wk for up to 6 guests, plus all expenses. BONNIE LYNN, a 72-foot schooner, offers flexible accommodations for 6 in three cabins with double and single berths (two full guest baths). Captains Earl, born and bred in Maine, and Bonnie MacKenzie provide an authentic New England experience. The warm, relaxed atmosphere and Bonnie's wonderful seafood bring guests back time and again. Her "chowda" is not to be missed! VENTURE is a beautiful Oyster 62 sloop with a crew of two. Venture accommodates up to 4 guests in 2 cabins. Or, maybe your budget is a bit tight but you would still like to go sailing? We would highly recommend Storm Petrel. We are looking forward to Phil & Laura's return to the Caribbean in November, but you can enjoy their company NOW! Storm Petrel is a Robert's designed 44-foot Offshore 44 sloop. Phil Levine is the captain and owner of Storm Petrel. His chef/crew is his girlfriend, Laura. Storm Petrel has a queen cabin aft and a V-berth cabin forward. They have an 11-foot dinghy with 15HP motor, windsurfer, hammock, snorkel equipment. Besides enjoying windsurfing, we recently learned that Phil also does kite boarding! In fact he has three kites and a couple of boards on his boat, in addition to his wind surfing gear. Alcoholic beverages are not included in their rates, but will stock with your preferences at cost. Motor yacht SILVER SEAS is available for charter through October 15, 2008, based out of Annapolis. SILVER SEAS is a 107-foot, Pristine Elegant Burger motoryacht and accommodates up to 8 guests in four cabins. SILVER SEAS is an ideal yacht for an elegant Autumn cruise. Enjoy delicious seafood (especially the famous Bay Crabs! ), gorgeous sandy beaches, inland rivers, and historic towns such as Annapolis and the vibrant city of Baltimore. Captain Tim Merrick and his crew are standing by to welcome you aboard! "I meant to mention Sasha in the other message. He was remarkably well behaved and a delight to have as a member of the crew! The boys were never bored and were worn out by bedtime! Sleeping on the trampolines under the stars was the best! Attached are a few pics! Sasha is a super ship's cat! Marcella & Gus with the parents. Thanks again Gus & Marcella for another happy charter. We know we can always depend on you! The charter motoryacht Shining Star, has lowered their rates for the new charter season, and up to two kids under the age of 12 can come along for free. SHINING STAR is a fully air conditioned, 58-foot DeFever motor yacht which accommodates up to 6 guests in three cabins with ensuite heads; two with full Queen berths, and the other with a Queen V-berth (not bunks as shown in layout diagram). Shining Star has a 15-foot dinghy with a 60HP 4-stroke motor, waterskis, tube, wakeboard, two-person kayak, fishing gear, snorkel equipment, etc. 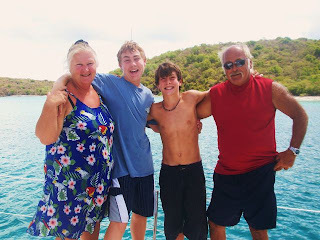 Mike is a dive instructor and diving is included in their rates for both certified and non-certified divers. 1 or 2 kids under the age of 12 are free. (If it is a 6-person charter with 2 free kids, the crew takes one of the cabins and the kids can have the pull-out Queen in the salon). SHINING STAR is available for CHRISTMAS and NEW YEARS. Hard to believe it has been 2 months since our trip! We are all still telling friends what a total blast it was. A totally unique vacation experience! The boat was comfortable and Gus and Marcella were wonderful hosts. Very accommodating in every respect. They made every day fun and exciting and the food was awesome. They showed us all the best places and we went where the bigger ship can't, exactly what we wanted. With their extensive experience in the area, they knew all the best spots. Gus is a very competent and experienced sailor and he made us feel very safe the entire time. Every day was tailored to just what we wanted to do. There was plenty to do for all of us, even if we wanted to do nothing! We would, without reservation, highly recommend the boat and crew to anyone considering this trip. There are lots of choices available to be sure but we can't imagine having a better time! Gus and Marcella are totally committed to their guests having a great time and they deliver. We plan on doing this again in the coming years. Thanks for all your help in planning the trip too. The whole process was easy. All we had to do was show up at the marina and the rest was taken care of. How great! MAROLANGA is one of our favorite charter yachts. Gus & Marcella are such a warm couple. They make you feel very comfortable and welcome aboard their home, Marolanga. 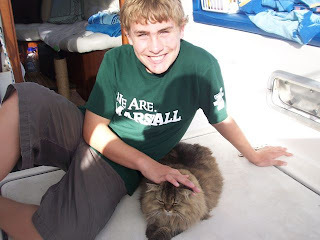 And Sasha, the ship's Persian cat, completes the family feeling. Unfortunately (for you!) Marolanga is already booked for Thanksgiving 2008, and this Christmas and New Years, too. They are currently open for Easter and possibly for your kids' spring break depending on dates. Contact us for availability! Book Seagull II now and receive 8 VIP tickets for Madonna's September 25th concert in Budva, Montenegro. SEAGULL II is available for charter in Croatia for their low seasonal rate of €80,000/week, plus all expenses, but NO delivery fees. This would sure brighten up a Madonna fan's day! Go for it!!! Rate: €80,000/week, plus all expenses, but NO delivery fees. Charter yacht HIGHLAND BREEZE, a 112-foot Swan, has reduced their rate for the 2008 Atlantic Rally for Cruisers (ARC) November 22 through December 13, 2008 from Las Palmas, Gran Canaria (Canary Islands) to St. Lucia. Currently, Highland Breeze is the largest yacht entered in the ARC race and is definitely a contender to win this annual trans-Atlantic event. Charterers need little experience and will enjoy being an active crew member learning to sail while enjoying this superb yacht and racing across the Atlantic. Nautor’s Swan yachts are considered the ultimate ocean-going, performance, luxury sailing yacht of unrivalled build quality. HIGHLAND BREEZE sleeps up to 8 guests in 3 spacious cabins. Her master cabin is located aft and has a queen size bed as well as a lounge area complete with writing desk. Her master cabin also has satellite TV, DVD and video. The second and third guest cabins each have two lower twin beds along with a pullman berth. All cabins have their own private ensuite facilities, DVD player and radio system. The ALL-INCLUSIVE rate which includes food, drinks, fuel, race entry, berths, and sailing lessons, for this popular, annual ARC rally / race has been reduced to €85,000 for a 3-week charter for up to 8 guests. So, if you want a yacht charter for the ARC, consider Highland Breeze! 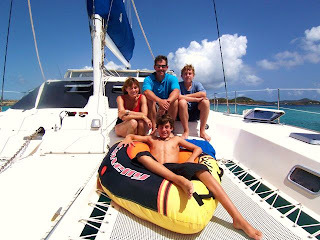 The popular BVI sail / dive trimaran PROMENADE is almost fully booked for next season (2008/9) but Kerry has opened up one week especially for a cabin cruise charter in the British Virgin Islands from March 29th through April 4, 2009. There are currently 4 cabins available. The cabin rate for this 6-night charter is $3,600 for 2 people (not each person). 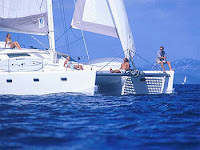 The 75-foot luxury charter catamaran MATAU, is offering a 10% discount for charters in September 2008. 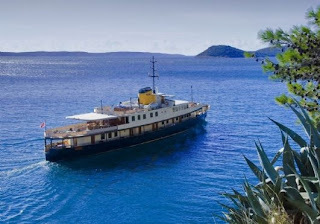 MATAU is available September 4-28, 2008 for charters in Croatia, Italy or France. 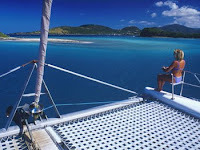 MATAU is currently available for a NEW YEARS charter in ST.VINCENT AND THE GRENADINES! Join LADY VICTORIA, an 88-foot motor yacht, on her travels southward this October (2008) from Charleston to Georgia. From mid to early October Lady Victoria is available for a trip through this beautiful and interesting area as she heads back South for the winter. Highlights for this area: historic cities, calm and scenic waterways, wildlife, golf, tennis, and numerous other activities. Board in historic Charleston. Tour the city by horse and carriage, a great way to relax and enjoy the architecture and history of this beautiful place. Cruise down the waterway to Kiawah Island and play a round of golf at the famed Ryder Cup Ocean Course, have a day at the Serendipity Spa or just enjoy the scenic and peaceful marshes. Have a leisurely and calm cruise down the waterway to Beaufort, SC. Walk take a stroll through the town, or go fishing and crabbing in the creeks. Stop in Hilton Head Island for a visit. Harbor Town has activities for everyone: world class golf, tennis, shopping, miles of scenic and safe bike trails set up for every level. Cruise through beautiful winding creeks to the Savannah. Walk down the cobblestone streets and explore the lush parks of this historic city. Visit the Garden of Good and Evil. Plunge into the nightlife on the waterfront of River Street for an interesting evening. Cruise down the waterway through the Sea Islands of Georgia. This part of the trip has many possibilities: visiting numerous anchorages or quiet marinas in small towns, such as Isle of Hope, Cumberland Island National Park and historic Greyfield Inn. St Simons Island is a great place for beach combing. This itinerary is, of course, flexible and Captain Shan will be happy to discuss ideas for a unique trip through this interesting, 'road less traveled' area that he knows so well.